The date of December 1st, 2018 won’t easily be forgotten by the people of Central Illinois. A time of year when people are normally preparing for Christmas by putting up the Christmas tree and placing wrapped gifts beneath it. And stringing up the outside lights on the front of the house along with the other yard decorations. Preparations were also being made in the town square of Taylorville – yes they still do exist – for the Christmas Parade scheduled to occur that evening. People would soon line up around the square to watch the high school band march by – the Taylorville Tornadoes ironically. Along with floats and other community groups participating in the annual holiday event for this community of around eleven thousand people in the heart of Illinois farming country. But on this date the people of Taylorville were watching an ominous sky headed their direction. Brought on by unseasonably warm temperatures that had been experienced in recent days. As civil authorities in Christian County watched the weather reports and were deciding on whether or not to cancel the evening’s festivities – which fortunately they decided to indeed cancel the parade – most people went about their business while still keeping a wary eye on the dark sky to the south. Sadly that ominous sky arrived over Taylorville having already wreaked havoc on other small Illinois communities before it reached the home of the ‘Tornadoes’. Bringing with it a major thunder storm which included at least one, possibly more funnel clouds which touched down within the small Illinois town. 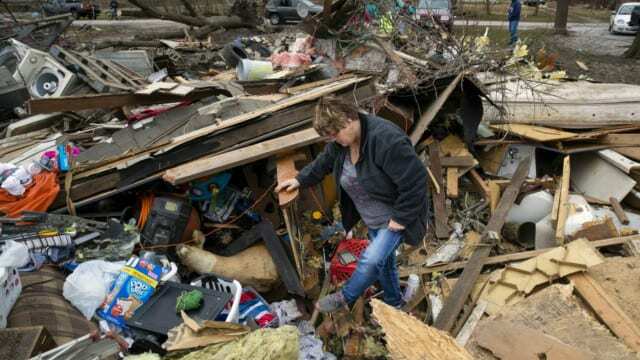 The damage was severe, completely destroying many residences and other structures, and trapping a number of people inside the rubble that once was their home. Miraculously thus far there have been no fatalities blamed on the storm, though some serious injuries have resulted. One touching story making the rounds is that of a family that sought refuge from the storm inside the bathtub of their house. As the storm tore away their home from around them and moved onto the next structure, leaving nothing behind but the bathtub with the family inside, one of the small children looked up and saw only sky where a roof and walls once stood. It’s reported that the child asked his father, “Are we in Heaven” ? 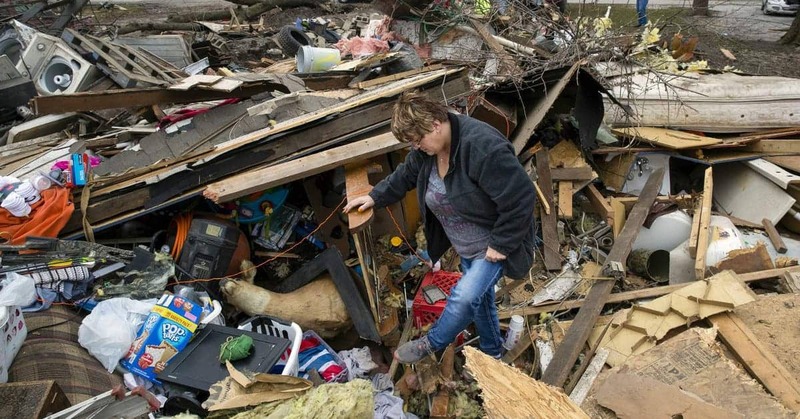 Certainly the extensive damage that was caused by the storm will be remembered by those who were affected personally, but I’m betting what will be remembered the most has been the response from the people of Illinois who came from miles around to help the victims and the community recover. Almost immediately strangers began showing up carrying chain saws, driving pick-up trucks, some with trailers. Using shovels and strong backs to help out, whatever was necessary to help remove the debris and clear the fallen trees and tree limbs that came crashing down during the storm. Some victims were handed a handful of cash by a perfect stranger to go buy a warm meal while the man they never knew before went to work clearing the mess left behind. Most never gave a name they just went about the business of helping someone out, and then moved onto to the next victim who needed help. What will be remembered is how real Americans came together to help others during a time of need. No whining and wailing from the people who had lost everything, nor any angry demands that the government help them. Just a determined look on their faces, and the resilience common among those who make up America’s heartland. Yes December 1st will long be remembered by the people of Central Illinois. But you won’t hear any “woe is me” comments emanating from those whose lives were torn away from them. The Christmas Parade will be rescheduled, the lights and holiday decorations will hang brightly from the lampposts, and the people of Taylorville will line the streets around the town square to enjoy an evening of revelry, and community.